When completing an enrollment from the Admin side, you can use the Add Payment option which allows you to collect the payment for the ECFE enrollment using more than one payment method. The Add Payment in the Cart Checkout can also be used to collect a partial payment now and set the balance due as a Pending Payment to be collected at a future time. If the balance is set as a Pending Payment, you can use the Collect option to collect the remaining balance with a future payment from the Admin side or it makes it available for payment on the Public side. Start the enrollment until you get to the Cart Checkout section. In the first payment section, select the name of the payer, enter the payment method information and adjust the total class cost amount to reflect the partial payment being made. In the second payment section, select the name of the payer (Note: This can be the same person), enter the 2nd payment method or set the payment method to Pay with Pending Payment (collect later) and change the amount to be the balance due. 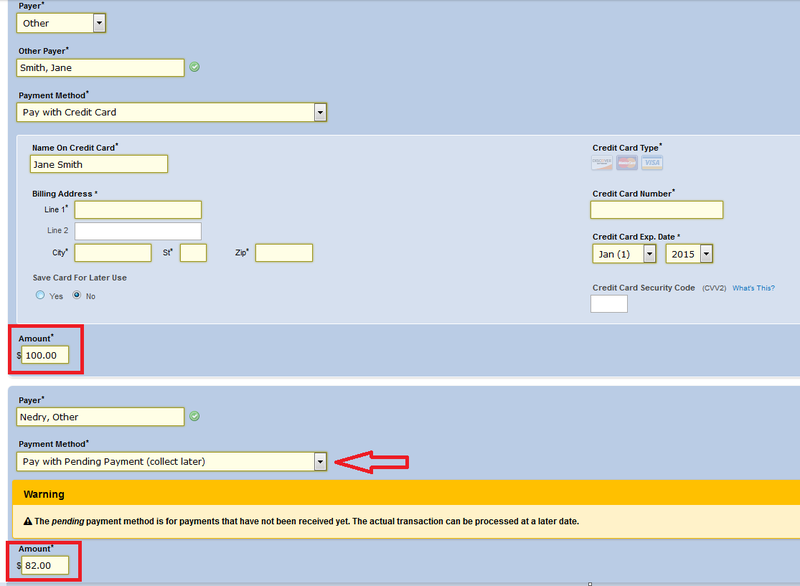 If the payment was set to Pending, when you need to collect the remaining balance, select the for the pending payment line item in the Enrollment Show Page then select and complete the payment form.